Clean, tone and moisturize your skin daily with these effective products that are additive-free. Our HABA 4-sample set contains laminated sample sizes of 2 cleansers, toner and moisturizer. Included: Oil Cleansing (which you use when wearing makeup), Powder Wash (when not wearing makeup), VC Lotion toner, and Squalane - a clear oil that is absorbed completely by your skin. If you'd like to learn more about HABA, try one of the products - and toss this Trial Kit in your shopping cart for a luxurious way to sample many of the most popular products. Oil Cleansing is applied either with cotton pad or worked into dry skin, then rinsed with water until the oil turns white and then clear. Powder wash is rehydrated with water and used to clean your face when wearing no oil based eye makeup or foundation. VC Lotion is applied with hands or a cotton pad. Squalane is nothing but pure squalene, a few drops applied to moist skin is immediately absorbed for silky moisture and no oily residue. 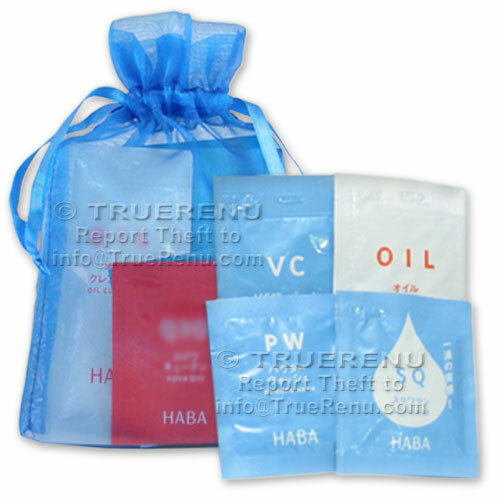 Product Size: 4 Product Samples in laminated foil envelopes, providing more than 2 uses each. These are commonly used sample sizes, not full-sized products.